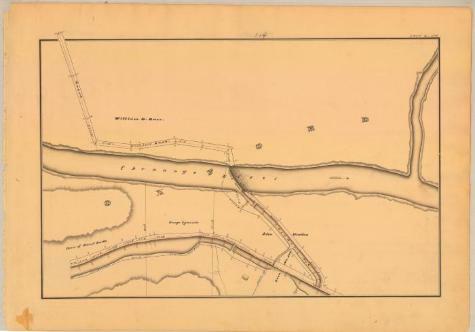 This is an ink, wash and charcoal map of a section of the Chenango Canal in Oxford. It shows the Chenango River, a stream that connects to the river, a state dam, Feeder No. 4 which enters the canal at two points, a guard bank that runs along the top of the river, Lock No. 100, three bridges and a building. The red lines indicate courses and distances. The blue lines indicate canal right-of-way. The map also shows the properties of William D. Race, Heirs of David Bartle, George Symonds and John Stratton.